While trying to stoke the flagging flames of the horror boom, Hollywood studios inevitably turned to recycling existing films. 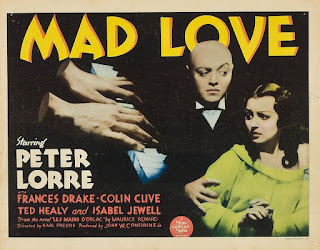 Mad Love in 1935 was a remake of The Hands of Orlac, the 1924 German Expressionist classic directed by Robert Wiene and memorably starring Conrad Veidt as the concert pianist whose newly grafted-on hands after a horrific accident formerly belonged to a murderer and now develop a homicidal life of their own (reviewed here on 12/1). 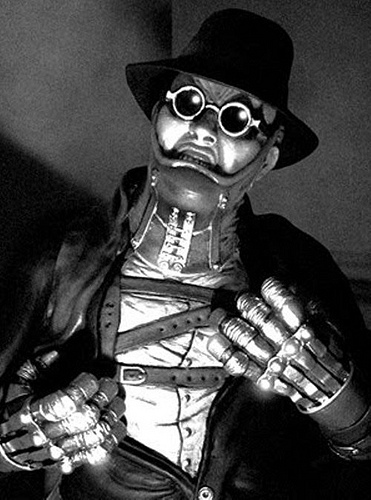 For M-G-M’s American version, horror writer Guy Endore adapted a translated adaptation of Maurice Renard's source story Les Mains D'Orlac set in Montmartre, Paris and collaborating on it with Karl Freund who had by now converted his highly-regarded cinematography career into being a Hollywood horror director of note with The Mummy (1932). Freund’s own choice of cameraman Greg Toland (supplementing the studio’s choice of Chester Lyons for eight days of additional shooting after-the-fact) would also make his mark, achieving fame for his ground-breaking lensing on 1941’s Citizen Kane. 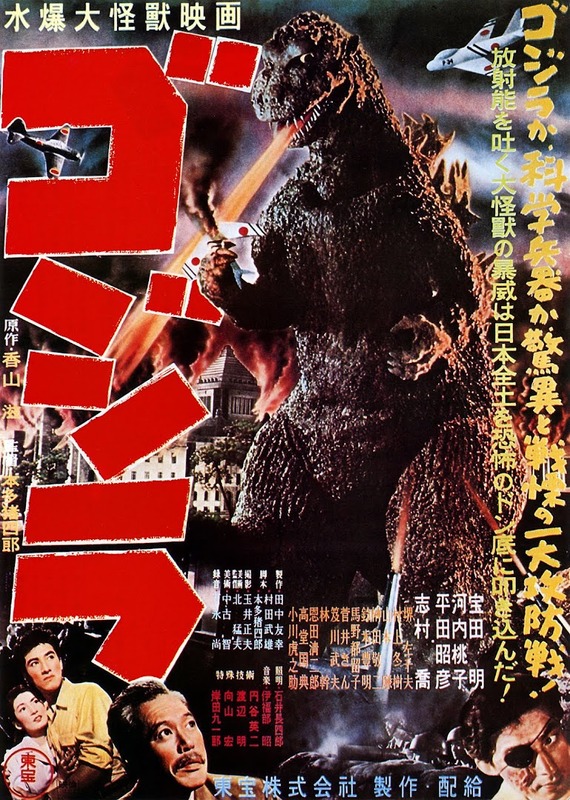 This association with Orson Welles’ classic invited uncomfortable comparisons as we will see. Mad Love hews fairly close to the basic plot of The Hands of Orlac but focuses more on the surgeon Dr Gogol who carries out the operation rather than his victim Orlac – here named Stephen instead of Paul. Even though the esteemed Colin Clive writhes in torment superbly as the possessed pianist, he is under-used and overshadowed by the maniacal motivation of Peter Lorre whose film this is. Both actors are perfectly cast in roles that channel their most defining qualities. 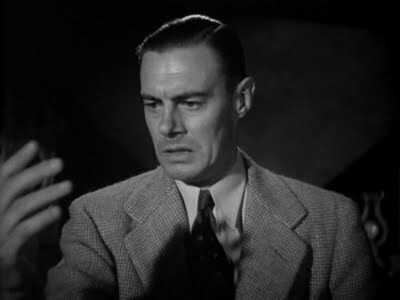 Clive inhabits the same furious frustration that made Conrad Veidt so believable in the original, his genius thwarted not by society as he conveyed scorchingly in the Frankenstein films, but by his own body revolting against him. It’s unfortunate that we see so little of him. Lorre, meanwhile, as Gogol makes use of that beguilingly forlorn manner he somehow pulls off with barely any facial expression, the impassivity belied by his sinister, silkily unctuous voice which renders an extra dimension of sympathy even to the Grand Guignol villainy that he triumphantly succumbs to at the end. There’s a rich seam of supporting performances to enjoy, including a typically spirited cameo from the instantly recognisable comedy star Billy Gilbert, Laurel and Hardy’s explosive nemesis in The Music Box and Chaplin’s The Great Dictator, who plays an overgrown schoolboy autograph hunter of criminals on the early fateful train journey shared with Orlac. It is he who leads us to Rollo, the surprisingly affable murderer catalyst (Edward Brophy, who had the same surname as the circus owner in 1932’s Freaks). There is an interesting later resumé connection between the two actors who would both go on to voice animated roles in Disney favourites – Brophy as Timothy the mouse in Dumbo and Gilbert lending his vocal skills as Sneezy in Snow White and the Seven Dwarfs. The wise-guy reporter who pursues the emerging story is Ted Healy who’d already had a hugely-lucrative vaudeville career and put together the Three Stooges. More obvious comic relief is provided by Mae Beatty as Gogol’s permanently sozzled housekeeper Francoise with pet cockatoo always on her shoulder. Rollo demonstrates his unnerving knife-throwing talents to Orlac with a pen which will prove mightier than a sword as the plot unfolds. In the aftermath of the train crash, Orlac’s wife Yvonne, a hard to resist Frances Drake, appeals to Gogol to save his precious hands which are scheduled for amputation. We already know that Gogol is obsessed with her as he’s seen her perform on stage for 47 straight nights and keeps a waxwork double of him that he names Galatea. He concurs with the proposed amputation, yet such is his all-consuming desire for Yvonne that he is seized with a daring notion inspired by seeing Rollo guillotined: “Impossible? Napoleon said that word is not French!” Neither is the rest of the film as such, but no matter. Before you can say medical montage, Clive is enjoying an idyllic post-op picnic with Drake on the river-bank, his hands bandaged into ungainly paddles. Upon unwrapping his digits, Gogol assures him that after painstaking massage and ultra-violet treatment, he will again play like a concert star. Clive gives us an all-too-brief glimpse of Orlac’s inward struggle in these scenes which tragically were mirroring his own real-life inner demons, By now in reality the actor was gradually succumbing to the fatal alcoholism fuelled partly by homosexual angst that would kill him within two years. In close-ups Clive gets away with the prematurely aging bags under his eyes which play into the character, yet he’s painfully thin when in shirt-sleeves, his arms and torso wizened. He was already starting to look much older than 35. When the piano-dealer comes calling for his outstanding payments, it sparks off the first sign that Orlac’s hands have a murderous mind of their own, kept secret from him by Gogol. The hapless dealer isn’t the only one to almost be impaled on a nib. The couples’ finances are so grim that a visit to his estranged father nearly causes the same fate for Orlac senior. Orlac pours out his anguish to Gogol, who whips up a little off-the-cuff psychoanalysis to throw him off the scent of the real origin of his extreme extremities. Yvonne is at least shrewd enough to see through Gogol’s self-interested diagnosis and here Mad Love really earns its title and echoes of Citizen Kane. Gogol is hounded by his split personality goading him to a more deliberate torture of his patient. The mirror image is at first reminiscent of Smeagol/Gollum’s schizoid duality in Peter Jackson’s Lord of the Rings, yet in Toland’s filming and Lorre’s bald-headed fury, we can almost see Orson Welles’ older Charles Foster Kane. In her essay ‘Raising Kane’ critic Pauline Kael went so far as to accuse Welles of purposely imitating Mad Love in both its protagonist’s appearance and the set designs for Citizen Kane, causing champion defender and friend of Welles, fellow director Peter Bogdanovich, to dismiss these charges. For my money, the most impressive design feat is the disguise Gogol adopts to push Orlac to the brink of insanity. He impersonates Rollo in a bravura costume and prosthetics that combine Guignol horror with Marvel Comics’ Doctor Doom. He sports a plastic neck-brace with metal brackets, a medieval knight’s gauntlets and round-framed shades that draw attention to his toothy rictus grin, topped with a fedora. This elaborate super-villain outfit releases the pent-up megalomania within Gogol (and Lorre, splendidly so), brimming over into cackling expository triumph when he returns home – all the better for the writers to bluntly contrive Yvonne hearing his guilt. Another clue to his frothing madness, if we needed one, is his playing of the organ – does anyone sane or virtuous ever play one in a horror film? The man’s so unbalanced that when she pretends to be Galatea to avoid being caught snooping, he believes it is the statue of his beloved come to life. The ending is clearly rushed and betrays the gap in the narrative where The Hands of Orlac had deepened our relationship with Orlac by having him collaborate with the police to prove his innocence. Here, the cops and the almost-framed hero simply rush in to save Yvonne and end Gogol’s dubious practises. Mad Love wasn’t a success on its release despite Charlie Chaplin hailing Lorre as "the greatest living actor" yet has gained a strong and deserved following since.